Usually you try to protect your drone and avoid any obstacles, Air Wars Battle Drones turns that around. 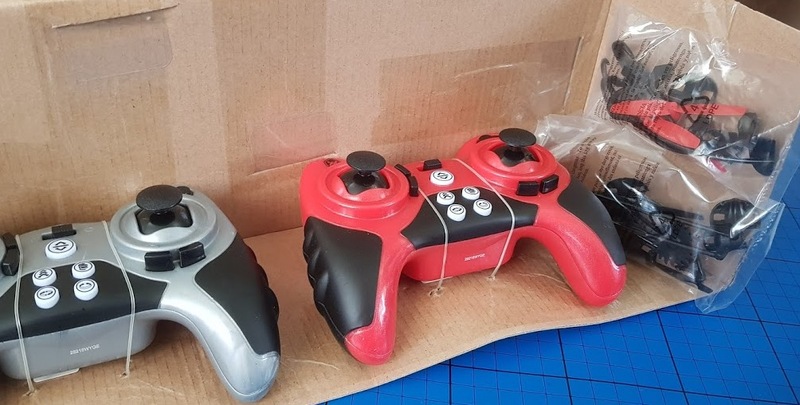 This 2 drone, 2 controller set also has a selection of 'weapons' to attach to each drone before you try to knock your opponent out of the sky. Packaging is almost all card and very easy to open. Inside the box are two drones, two 2.4GHz controllers, two USB charge cables and battery charge packs, 10 assorted weapons, a complete set of spare blades for both drones and instructions. The controllers are really straightforward and very familiar if you've ever used a drone before - a standard games console style controller with joysticks and buttons. 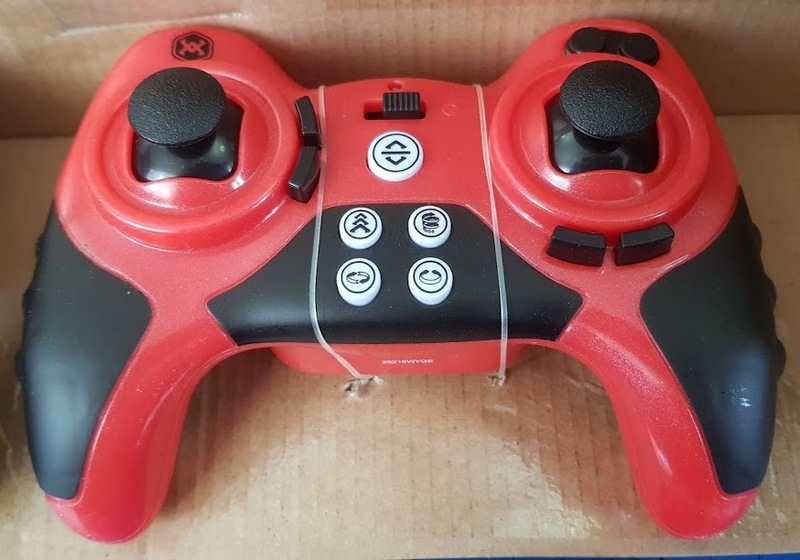 They have separate buttons for take off/land, and 4 pre-programmed 'attack' buttons which perform stunt moves to catch your opponent out - and yourself until you get used to them! 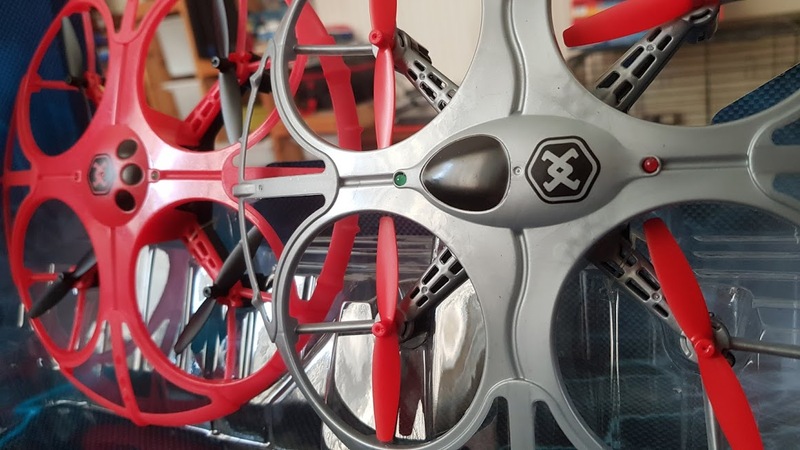 Brilliantly batteries are included for the controllers, so as soon as you've charged your drones, you are ready to go. They arrived half charged and charging is really quick - we haven't been able to time it as it's always caught us out, but under 1 hour for 6 minutes play. The drones themselves are really flexible and blades are protected by a round frame. We haven't managed to damage either yet - despite many battles and our less-than-accurate flying! 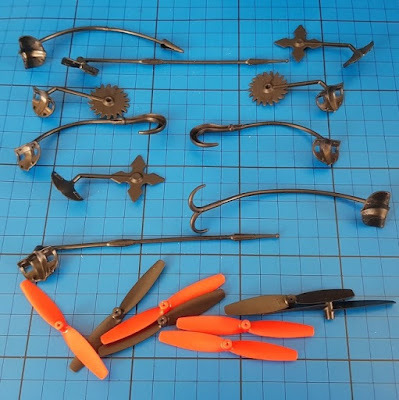 The assortment of weapons is interesting, although they don't really pull the other drone out of the air - bashing into them does that! Weapons just clip onto the edge of the drones and remove easily. I admit most of ours are now down the back of the sofa or behind cupboards. You really can't be precious about them or you'll get frustrated - they're very easily lost mid-battle. 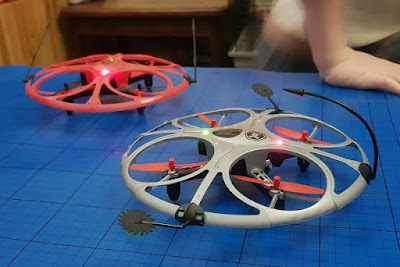 The Air Wars Battle Drones are last year's technology and don't have cameras or fancy sensors, but they are easy to control and my 8 and 9 year old boys can have a fair battle. As long as both players are on a fairly level ability, almost anyone can play. Once you increase in skill it'll be more of an actual battle rather than a stramash. 6 minutes is plenty of time to have a really good fight and a few crashes. Air Wars Battle Drones are sadly no longer available unless you manage to find old stock. . Loads of fun for your money and ideal for beginners as they are so easy to fly. Shame. 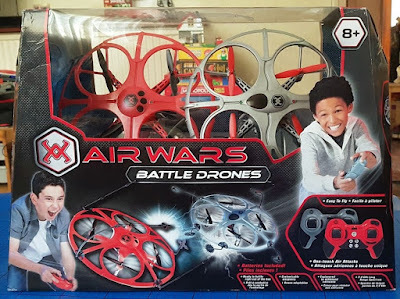 We were sent our Air Wars Battle Drones for review.